Ptolemy Harry Fooks was born in Yeovil in 1898, son of Yeovil-born glove cutter William Fooks (1855-1928) and Ellen née Palmer (1865-1920). In the 1901 census William and Ellen were listed at 51 Earle Street with their eleven children: Edwin (b 1881), Minnie (b 1883), Gerty (b 1884), Nelly (b 1892), Ivy (b 1893), Reginald (b 1894), Alonzo (b 1895), Phillip (b 1896), 5-year old Ptolemy, Percy (b 1899), Betona (b 1900) and granddaughter Rosie (b 1901). By the time of the 1911 census the family were still at the same address but there were another three children; Violet (b 1901), Dora (b 1902) and Linda (b 1904) - as well as a lodger! Ptolemy, by now aged 13, was working as an errand boy for a milk seller. It is not known when Ptolemy enlisted but, from his Service Number 240408, it was most likely in late 1917. He joined the 2nd/5th Battalion, Somerset Light Infantry (his older brother Reginald was a Sergeant in the same Battalion). The 2nd/5th was a duplicate of the 5th Battalion, formed in September 1914 as part of the 45th (2nd Wessex) Division. The Battalion was stationed in India from December 1914 where they were attached to the Burma Division. In fact life must have been pretty quiet in India during the Great War - the Regimental History of the Somerset Light Infantry doesn't even mention the 2nd/5th Battalion after about 1916. Certainly the Battalion is supposed to have spent some time on the North-West Frontier and some historians think there was involvement in the Third Anglo-Afghan War (also referred to as the Third Afghan War) which began on 6 May 1919 and ended with an armistice on 8 August 1919. However the Regimental History only mentions the 2nd Battalion in connection with these events and it may be that Ptolemy was transferred to the 2nd. Indeed, after the outbreak of war only eight Battalions of British troops were retained by the Government in India - 2nd King's Regiment (Liverpool), 2nd Somerset Light Infantry, 1st Yorkshire Regiment, 1st Duke of Wellington's Regiment, 1st Royal Sussex Regiment, 1st South Lancs Regiment, 2nd North Staffordshire Regiment and 1st Durham Light Infantry. It is most likely therefore that men from the 2nd/5th Battalion, Somerset Light Infantry were temporarily transferred to the 2nd Battalion for Indian service. Of these British troops left in India the C-in-C in India said "The backbone of the Army in India at this period was the small contingent of British and Indian regular troops who, though precluded from sharing in the honours won by their comrades overseas, played a no less efficient and important part in the attainment of the common end by guarding the frontiers of India with a vigilance and devotion to duty which enabled the training of the Territorial units to proceed without interruption and the Indian Army to expand in a measure never before contemplated." Sadly Ptolemy was bitten by a female sand fly and contracted kala azar (visceral leishmaniasis or, kala azar, also known as Dum-Dum Fever). Kala azar is the second largest parasitic killer in the world - only Malaria is more deadly. The parasite is spread to humans by bites from infected female sand flies. It attacks the immune system, and is almost always fatal if not treated. The sand flies feed on animals and humans for blood, which they need for developing their eggs. If blood containing leishmania parasites is drawn from an animal or human, the next person to receive a bite will then become infected and develop leishmaniasis. Months after this initial infection the disease can progress into a more severe form, called visceral leishmaniasis or, kala azar. Although hospitalised at Colaba War Hospital, just outside Bombay, Ptolemy died of kala-azar on 16 August 1919. He was aged 21. On 31 October 1919 the Western Gazette reported "The death has occurred at Colaba War Hospital of Private Ptolemy Harry Fooks, sixth son of Mr and Mrs W Fooks of Vicarage Street. The late Private Fooks, who was in the 2nd/5th Somerset Light Infantry succumbed to “Kala Hazar” Fever. He was 21 years of age. His death recalls the striking example of patriotism and self-sacrifice made by this family during the war, no fewer that seven brothers serving in one or other branches of HM Forces. The eldest, Private Edwin Fooks, served with the Devon Labour Battalion; the second, Sergeant Frank Fooks, was on reserve when the war commenced, and immediately rejoined his old Regiment-the 5th Royal Irish Lancers. He went to France with one of the first contingents, and served in that theatre of war for four years, undergoing many thrilling experiences. The third brother, Sergeant Reginald, joined the 2nd/5th Somersets, and went to India; Private Alonzo, served in the RGA (Regulars), and his period of service does not expire until December. Sapper Stanley Fooks was in the RFA and afterwards the Engineers, and Percy in the Coldstream Guards. Four of the brothers have been demobilized, one is awaiting discharge, and one has signed on for further service. It is believed to be the only family in Yeovil from which seven sons served, although there were several with six and many with four or five." 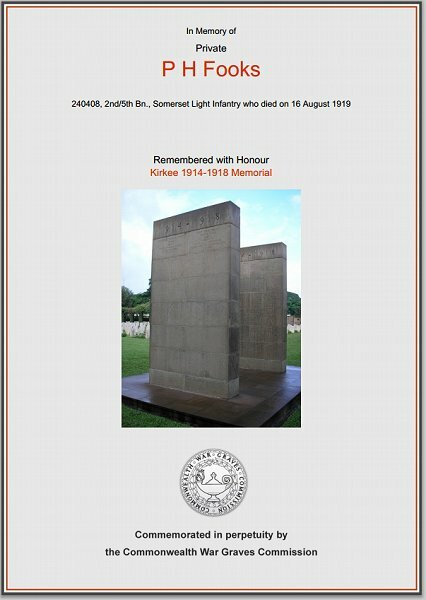 Ptolemy is commemorated on Face C of the Kirkee 1914-1918 Memorial, India, and his name is recorded on the War Memorial in the Borough, albeit incorrectly as Fooks, FT rather than Fooks, PH - probably as a result of his name being added after the original inscriptions. 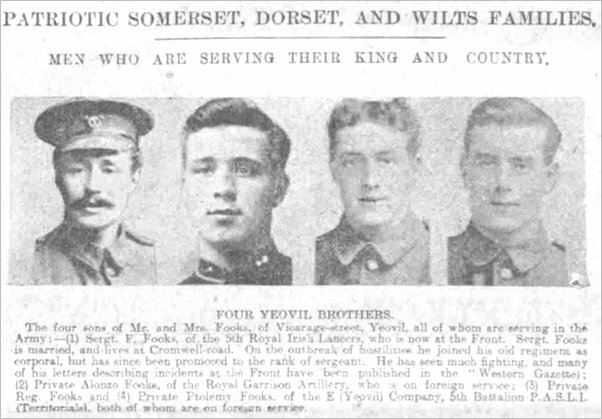 A newspaper report of the four fighting Yeovil brothers, with Ptolemy at right. The Commonwealth War Graves Commission certificate in memory of Ptolemy Fooks.